BenjiLock, the world's first traditional rechargeable padlock with fingerprint technology, aims to redefine personal security. A hybrid product, BenjiLock can support 10 fingerprints and can also be opened using a traditional key. Founder Robbie Cabral debuted BenjiLock at Eureka Park during CES 2017, and his product was named an Innovation Award honoree that year. Cabral was hungry, and he saw CES as an opportunity to showcase his passion, network and get the word out about his innovative device. During CES 2017, Cabral participated in the Shark Tank casting call and was selected to pitch BenjiLock on ABC’s hit show. Two of the sharks made an offer, and Cabral accepted a deal from Kevin O’Leary and his team at Hampton Products. If there’s an opportunity for me to showcase the passion and the product, this is it. 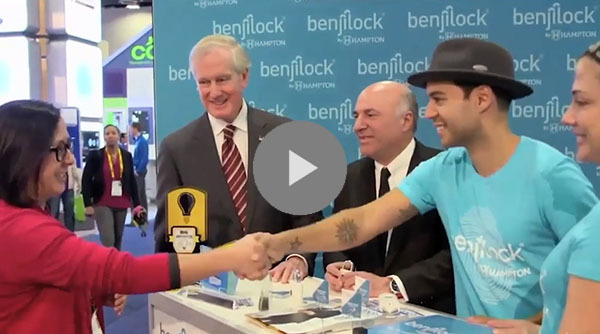 Cabral returned to CES and Eureka Park in 2018 with a smaller version of his hybrid lock, BenjiLock Mini, and won a second Innovation Award. With a patent in hand, and a partnership with Hampton Products that is helping Cabral take his next steps, BenjiLock has deals with retailers Ace Hardware, Amazon, QVC and Walmart. BenjiLock is returning to CES 2019 with Hampton Products International’s exhibit.